Both top feed and side feed EFI Injectors require quality service and repair components to ensure correct fuel flow through the injectors, and for safety reasons the long term continuous sealing of fuel under pressure through a range of extreme temperatures and operating conditions. For this reason new seals must be fitted whenever an injector is removed from its sealing surface. The renewal of any “buffer” rubbers is also required to ensure the correct seating and location of the injector. A full range of refill components are also available to replenish the kit as required, with the range including over 170 part numbers as well as the Repair kit. 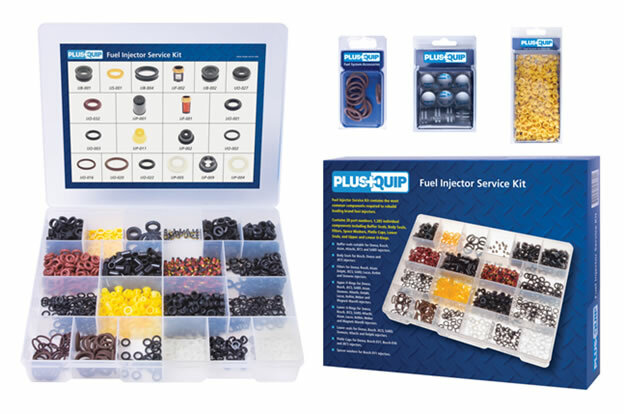 The PlusQuip Fuel Injector Service Kit and refill components are available from specialised resellers and leading automotive retailers.